I don’t have a lot of time to write on this computer, and internet connection can fade out at any moment, like the electricity and the water. Today another bit of reality struck. 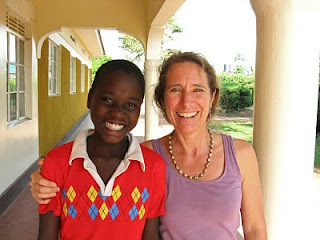 A young girl, perhaps 12 or so, came in with one of the volunteers, Christine, from the clinic to visit Brigitte, another German volunteer who is now laid up with potential malaria or typhoid. Brigitte was too ill to visit, and so "D", the bright eyed wide-smiled beautiful girl sat at our table as Marva the midwife and I ate lunch. She had a bright scarf with silver sequences wrapping her head, she lit up our hearts with her smile. Are you going to school, I asked? Today is the first day back to school after a 3 month break for all those who do go to school. No, she said, she is going home today…. She continued, “but I am not studying now. My mother, who paid for my school is dead.” “Oh, how very sad, “ I said. She nodded and swallowed. Apparently, she came here with her sick mother 3 months ago in November. Her mother died and now she is being sent home. “ Who will you stay with? “ I asked. “My stepmother.” Her face became grim. “But she abuses me,” she said. She tried to hold back tears, touching her eyes. “It must be scary then to go back there. “ She nodded. I didn’t know what else to say. Of course, I wanted to grab her and not let her go back there, conscripted now to a life of likely abusive servitude to the step mother. I ran through numerous scenarios.. adoption, finding a home, taking her away, talking to Dina whose organization is helping 5 poor go to school. But there are 1000’s, 10,000’s of children also in this predicament. “Do you read?” Marva asked her. “Yes.” “What books do you like?” “I like science,” she replied. “ My favorite book was a story about the earth.” But she will not likely ever be able to continue her interest. Instead, she will do chores for her stepmother, and be bought by some man, who will cause her to have one child after another, to prove his status and wealth. It is an ancient traditional belief, said the Ugandan midwife. From long ago, it was a symbol of wealth to have multitudes of children, and multiple wives who bear them and care for them. The wife herself is not important… only in that she bears plenty of children. Birth control can only be done in secret, if she has the means and access, but nothing permanent without a man’s consent. I tried to come up in moments with any potential possible scenario of rescuing "D" from her certain fate of servitude and abuse to her step mother. I thought of adoption, of just grabbing her and having her stay here, or contacting Dina whose organization is paying for 5 poor children to go to school. She was too cute, too bright, too open, to end up in this situation. But there are 1000's, no 10,0000's of children all in the same predicament. Their fate is sealed and there is really nothing I can do. Only to be kind. In that moment though, I did not know what else to say. I was trapped by my own emotional sinkhole. "D" left, and I sat and cried over my lunch remains as I watched her walk away into the life that she knew, too, would be terrible. The issues is too prevailing, too big for me to be able to really do anything at all, but just share in the kindness that also prevails amongst most of the people I am meeting.